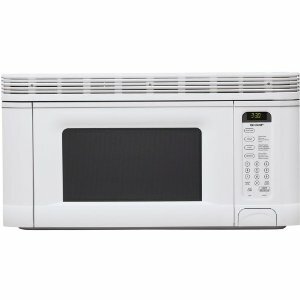 Over the range microwaves, also called microhood microwaves, are usually of great value, as they provide two functions. They do everything a standard microwave does and they also do what a range hood does – extract and get rid of steam, smoke and odors. They either have a vent to remove air to the outside or use a charcoal filter to clean and recycle air back in. Because the hood is on the underside of the microwave, they cannot be used on a countertop. However, choosing one of these gives you a great way to save counter space. They are made to fit into spaces between cabinets, which are usually 30” wide, and over a stove. When shopping for a microwave oven with vent, it is important to consider the wattage and CFM (air removal measured by cubic feet per minute). Microwaves of about 1000 watts will generally cook fast and with great efficiency. Anything below 700 watts will be disturbingly slow and will, in most cases, not cook food evenly. Most top rated over-the-range microwaves have a ventilation system that is rated at least 300 CFM but a lower rating is sufficient for kitchens that are naturally well ventilated. Choosing a small over the range microwave oven, just like with all other kinds of microwaves, will require you to first learn of what features each appliance has and what is there for you to enjoy from each type. Here are the five best over the range microwave ovens in the market at the moment. They are all available in 3-4 colors. If you’re looking for a no frills, no fuss, reliable unit, the Frigidaire FGMV175QW 1.7 cu. ft. Over-the-Range Microwave Oven compact over the range microwave is for you. It is well priced for its kind with unmatched features and ease of use of this unit. It also comes with well detailed directions for installation and all the necessary mounting hardware, which makes it quite an easy job even for one person. You can choose to vent this 300 CFM unit to the front, back or top, and there’s a 2 speed fan and two level stove light. It fits perfectly in a 30” opening and is designed for low clearance stovetop space. Its capacity is 1.7 cubic feet. It features a wattage of 1000, which is sufficient to evenly cook food at a reasonable pace. The glass turntable is used for all methods of cooking, while the Spacewise rack allows you to cook or reheat larger quantities of food by giving you two levels. However, the rack should not be used when using the Sensor or Auto cooking options in order to get an accurate finish at the end. Programming this unit is easy with 5 Sensor Cooking Options, Multi-Stage Cooking, Auto Reheat, Auto Defrost and Keep Warm Functions. There are multiple One Touch cooking settings for things like popcorn, baked potato, veggies, etc., melt or soften options, as well as Auto Cook functions for quick meals and dinner recipes. If you want complete control, you can set the cooking time and power level yourself and add 30 seconds multiple times to the original cook time if necessary. The LED display and button lettering is easy to read too. The only criticism that this unit receives is that opening and closing the door is quite loud. This GE JVM3160RFSS unit weighs only 61.8 pounds with a width of just under 30” and a capacity of 1.6 cu. Ft. It has a 2-speed venting CFM rating of 300 and has a cooking power of 1000 watts, which means that food will cook fast and evenly. Additionally, it has 10 cooking levels, which allows you to cook, reheat or defrost a wider range of foods and beverages. It also a one touch panel with 6 settings to express cook from 1 to 6 minutes, a timer and clock, and an on and off option for the turntable. Its shell is stainless steel and it looks good in the kitchen. It also makes it much easier to clean. There is a cook top light with two brightness levels in addition to the interior light. Installation is quite a job, even for two people. However, after that, it is quite simple to use and easy to clean. It also produces a lot less noise compared to most other such units. The turn on and off turntable feature is useful if you need to accommodate large dishes that don’t have space to rotate. It comes with a charcoal filter that efficiently cleans and recycles air but you can also convert it to vent upwards or towards the back if you prefer. This Amana AMV1150VAW unit also cooks at 1000 watts of power and at ten different levels for versatility of cooking. It has a 2-speed vent fan at 220 cfm. The default set up is to recirculate the air with a charcoal filter so if you want it to vent to the outside you’ll have to reconfigure it according to the instructions. It features a simple touch pad and a scrolling word prompt display makes operating it a breeze. You can choose from several auto-cook and auto-defrost options and an add-a-minute feature that greatly simplifies the cooking process. Even without reading the instructions, it is far easier to use compared to other models. It is a stylish looking appliance too. The biggest problem with this unit is the fan. It is too noisy for anyone to have a decent conversation around the kitchen area while cooking. While the capacity and size of the turntable is not the largest in this list, it is a great option at a low price for a couple or small family. GE Profile PVM9179DKBB 1.7 Cu. Ft. This is the most feature packed over the range convection microwave oven in the market. The GE Profile PVM9179DKBB capacity is 1.7 cubic feet and can accommodate small casserole dishes. With 950 watts and 10 heating levels, this unit can boil, reheat, defrost and cook a wide variety of foods and beverages. The biggest reason to buy an over the range microwave convection oven combo rather than a regular one is to get near oven-quality results on certain tasks, like baking. By using the Fast Cook feature on this unit, the combined microwave and convection cooking does just that. The Chef Connect feature gives you three quick options too. You can set it to automatically sync clocks and your range elements with the microwave’s light and vents. The cooktop lighting gives you 3 brightness levels, including night light, and the 3-speed 300 cfm external vent removes steam, smoke and odors efficiently. If you want to recirculate you can use the included charcoal filter kit. A control dial allows you to set cooking time and temperature in small increments. It also uses sensors to automatically adjust to optimal cooking time and temperature. You can see what the oven status is at anytime from the scrolling electronic display that also shows the time. A removable oven rack is useful for convection cooking and the turntable can be turned on or off as wanted. This microwave comes with a keep warm feature that keeps plates warm till the food is ready to be consumed. It is also easy to install, has an easy to clean ceramic interior, and has a stylish look. The unit is quite durable and has lots of features. Some users say that it is difficult to use at first. A few customers say that it quit working a few weeks after buying.